A gamepad that has PS5 level next-gen features, build quality and customisation options? Hook it to our veins! Yep, we're calling it… controller maestro Nacon has just gone and announced the best PS4 controller ever made, with the Revolution Unlimited Pro dropping jaws here in the T3 office thanks to its what only can be described as PS5 evoking next-gen design, features and build quality. Yeah, premium doesn't even cover it. On top of that drop-dead gorgeous traditional Nacon soft-touch casing with ring-illuminated right thumb stick comes a simply astonishing amount of high-level eSports-grade features and customisation options. Four shortcut buttons (S1/S2/S3/S3), a full function touchpad, two internal storage compartments and six additional weights to adjust the balance (2x10g/2x14g/2x16g), two pairs of joystick heads (concave and convex), three pairs of joystick shafts (30°, 38° & 46°), and a built-in 3.5mm audio jack is one hell of a comprehensive armoury to take into battle. The amount of customisation possible on the Nacon Revolution Unlimited Pro looks incredible. On top of this hyper-premium build and comprehensive feature list the Revolution Unlimited Pro comes with something that the Nacon PlayStation 4 Revolution Pro controller did not, wireless functionality. We criticised the original controller's lack of wireless functionality as potentially a deal-breaker for many users, specifically more casual gamers, so the fact that the Unlimited Pro allows you to get eSports-level stability via cable (3 metres) as well as a more home setup casual wireless experience (7-metre range) via included USB dongle is definitely a welcome boon. Another welcome addition is the ability for the Unlimited Pro to be used on PC, too. An EVA storage case is included with the Nacon Revolution Unlimited Pro controller. What we currently don't know about the Nacon Revolution Unlimited Pro is details about its slated customisation software, which the maker currently says is coming soon, but if it is as comprehensive as the physical customisation options then it sure looks like it is going to be top tier. Nacon's soft-touch casing returns on the Unlimited Pro, which ensures a high level of grip and comfort. 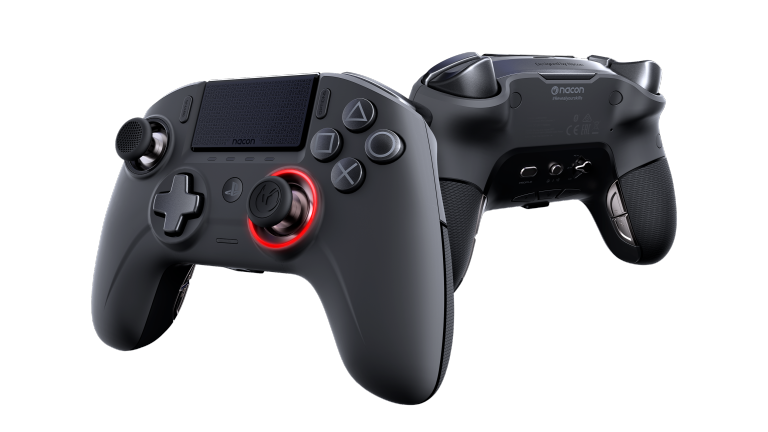 Pricing-wise the Nacon Revolution Unlimited Pro Controller will cost £149.99, and will be available in the first quarter of 2019, which pegs a release date before the end of March. The product is officially licensed from Sony Interactive Entertainment, too. For more information about the Nacon Revolution Unlimited Pro then check out the maker's official website.